I recently looked at JBOSS RESTEasy as a way to create and test RESTful APIs. The platform looks very promising with a lot of praise from developers. Also the documentation seems very extensive and precise. I started by downloading RESTEasy 1.2.1 GA and tried the sample code. I started with a java client to access existing RESTful Web Services and APIs. 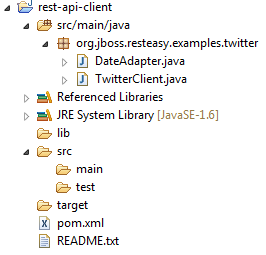 Among the api-clients, there is a Twitter small client that works out-of-the box (located under /RESTEASY_1_2_1_GA/examples/api-clients/src/main/java/org/jboss/resteasy/examples/twitter). However when I started to extract the code and wanted to create a Maven 2 based stand-alone project, I encountered some issues related to JAR dependency conflicts, including the following error message also described here. The most important piece, beside the cleaning of the POM file, was to include a pom that can be imported so the versions of the individual modules do not have to be specified (see RESTEasy documentation - Chapter 43. Maven and RESTEasy). I also made sure to have correct dependencies for resteasy-jaxrs and resteasy-jaxb-provider. mvn exec:java -Dexec.mainClass="org.jboss.resteasy.examples.twitter.TwitterClient" -Dexec.args="<userid> <password>"
(Replace last parameters by your twitter user and password). .updateStatus("I programmatically tweeted with the RESTEasy Client at "